I was laying in bed last night, staring into my closet and thinking about the townhouse we’re moving into next month. The new place has extremely limited storage space. Like, enough room to hang our clothes and that’s about it. When we toured the place and the landlord mentioned the lack of closets, Michael and I decided that it would be fine and, if anything, it would just encourage us to continue downsizing and getting rid of things we don’t need. So the past two weeks have kicked us into overdrive in going through and donating boxes and boxes of items. So as I was lackadaisically gazing into my walk-in closet last night, my eyes settled on my vintage, mustard yellow, hard-shell suitcase. I have the complete set: the large and medium suitcases, the train case, and a large, leather bag of the same color. It was a prize collection and had collected many oohs and ahs from friends over the years. There’s a history behind my attachment to those big, yellow cases. 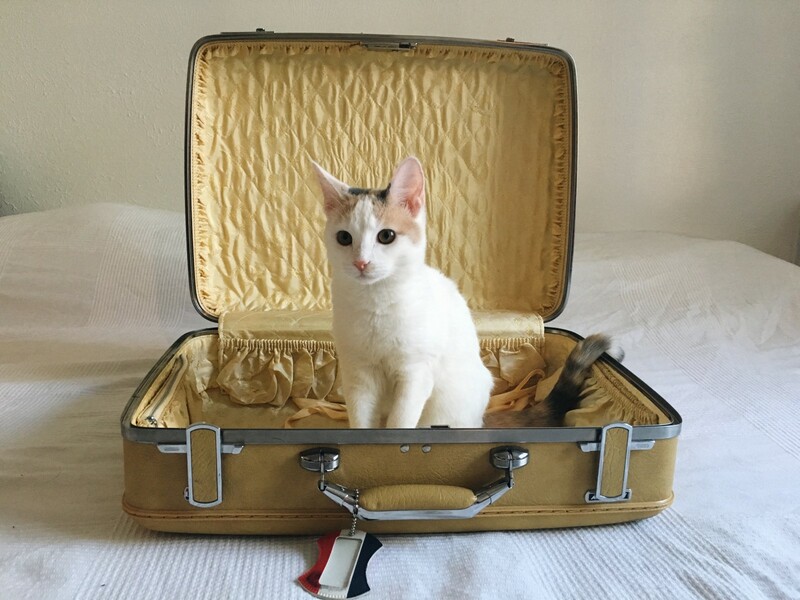 When I was a kid, my grandpa gave me his own yellow suitcase. The metal band on the front was etched with his initials and the fabric lining smelled like cedar and freshly-starched shirts. It was practically the same size as me, but I would load it up with barbies and scarves and fruit snacks and take it wherever I went. When I was 11, that suitcase was crushed in a car accident when a semi truck crumpled the trunk of my mom’s Geo Prism. So when I found the same yellow American Tourister suitcase (and the accompanying set) at a garage sale years later, I flung myself onto it and handed the woman $20. Aside from my personal nostalgia, there was just something romantic and methodical about packing clothes into that suitcase. The way shirts and dresses stacked so neatly. The ribbons that tied neatly over the top of the clothes to hold everything in place. Carrying it into the airport and feeling like I was on a grand adventure (looking fabulous as I went). And now it had been pushed to the back of the closet and replaced by more practical, rolling cases and duffel bags. As we begin packing for the new house, every item that goes into a box gets analyzed. It is useful? It worth the amount of space it consumes? And so an internal dialogue began about whether or not the yellow suitcase in the closet would make the cut. Are you taking that with you? I hadn’t even considered it. Well shouldn’t you? You haven’t used it once this year. And it reminds me of my Papa. You don’t need stuff to remember the people you love. Well does that mean I have to get rid of the whole set? Oh, have you used the others recently? And so it went. Arguing with myself. Of course, in the end, I felt at peace with getting rid of it. All of them. The hulking yellow cases that I have lugged around in so many moves and stored away in so many garages and closets. It makes me feel lighter each time I decide that I would be happier without some article of stuff. I’m learning that memories weigh much less than the items we keep, and that my vision, both into the present and the past, is much clearer without all that extra weight to carry around.